While many parents choose rice or other fine-milled cereal for their baby's first food, there's no reason not to consider other options, such as various pureed vegetables and fruits. Nutritious, full of fiber and easy to prepare, prunes are a fine first food choice for your baby. 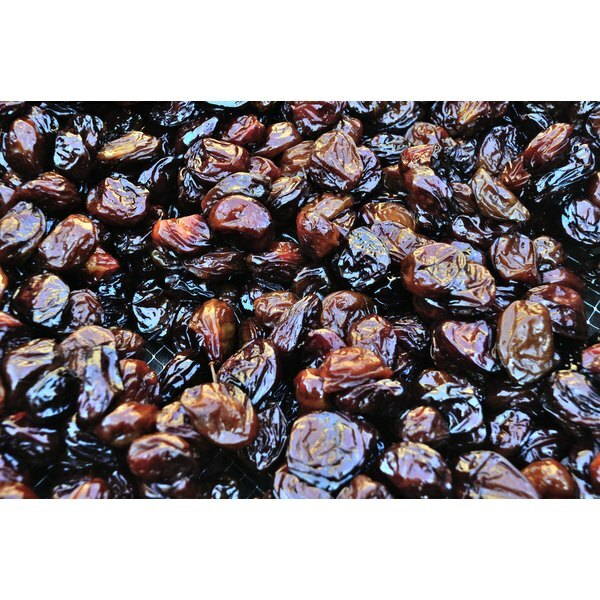 Prunes are the dried fruit of a specific variety of plum, which is smaller and less juicy than plums that are eaten fresh. Almost all of the prunes sold in the U.S. are grown in California's Central Valley, which also produces 60 percent of the world's prune crop, according to the Agricultural Marketing Resource Center. Prunes are commonly sold whole, either with pits or pitted. These days, prunes are often marketed under the term "dried plums," as this is considered a more consumer-friendly label. Prunes are easy to digest. Babies transitioning to solid food often suffer bouts of constipation, and the mild laxative power and high fiber content of prunes help counteract this. Prunes are also a good source of potassium and vitamins A and C. WholesomeBabyFood.com states that they are a low allergy risk. Many babies like the sweet taste of fruit as a first food and take to it quickly. The disadvantages of prunes as a first food are few. Some babies may not like the taste or texture. Some prunes are treated with sulphur as a preservative, so if you wish to avoid such additives, look for prunes specifically labeled organic and unsulphured. Prunes sold with pits intact can be difficult to puree at home. You can mix prune puree with other foods to make the new taste more palatable to your baby. Dilute with formula or breast milk, or stir some puree into prepared cereal or plain, unsweetened yogurt. You can also mix it with other fruit purees such as apricot or blueberry. If your baby likes prunes immediately, you can use then to slowly introduce other tastes, such as meat purees. You can buy packaged premade prune baby food puree, but it's also easy to make your own—and you'll save money and generate less packaging waste, too. Soak pitted prunes in warm water until they turn plump. Then puree the fruit in the blender, adding as much of the soaking water as necessary to achieve a smooth consistency. You may freeze the puree for later use if you like. Are Cucumber Seeds Bad for Digestion? What Is the Glycemic Index of Cranberries?